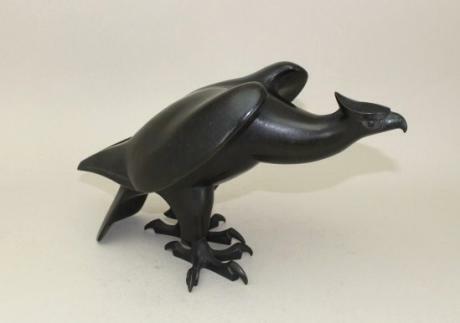 Japanese early to mid 20th century bronze eagle OKIMONO by metal artist MORIMURA TORIZOU (1897-1949). 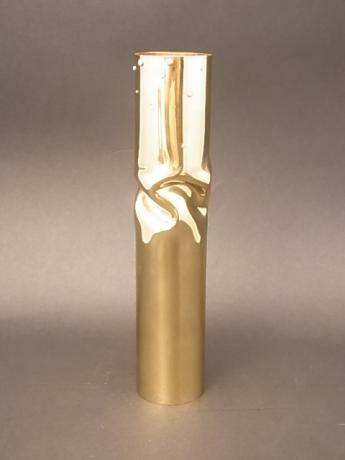 The eagle measures 10 3/4" long, 5" wide and 6 1/4" height. Morimura was born in GUNMA Prefecture. He attended the famous Tokyo Art School and graduated in 1918. 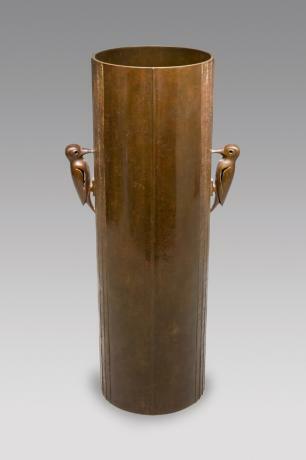 He exhibited at the TEITEN exh..
Japanese early to mid 20th century bronze vase by KIMURA SHOTARO. The artist exhibited numerous times at the Nihon Dento Kogeiten (including the 5th and 27th were he was an award winner) and served as a judge for the exhibiton as early as 1967. 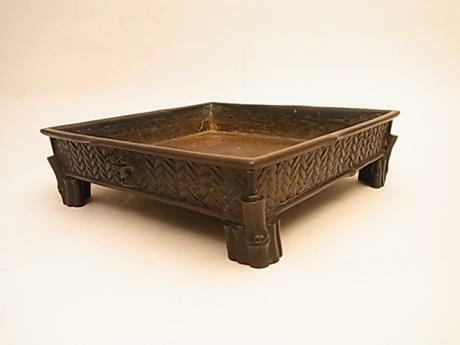 The vase has a simple verticle pattern with handles ..
Japanese 20th century metal vase with incised design. The vase is done with a floral design with butterflies. By SASAKI HIROSHI. 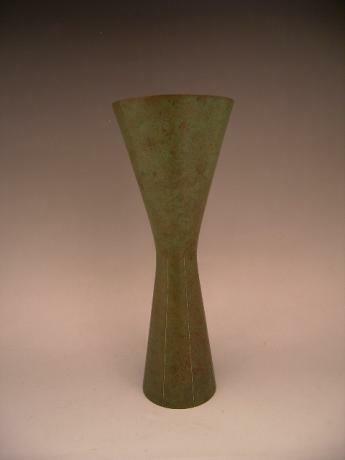 The vase was titled Autumn Dream and was exhibited at the NITTEN Exhibition in Showa 37 or 1962. 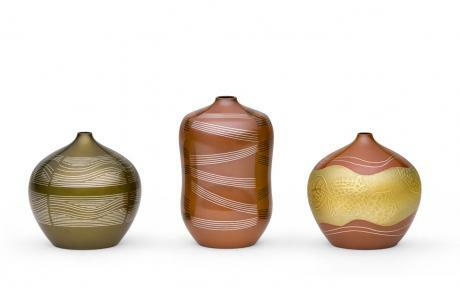 The vase measures 7 1/4" tall and 6 1/2" in diameter. 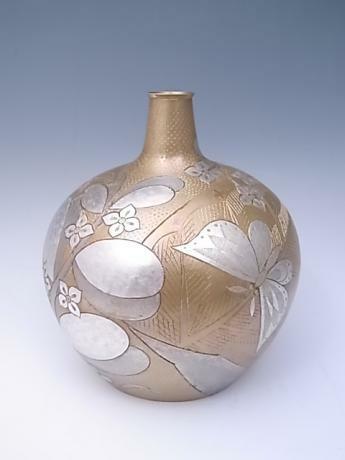 The vase come..
Japanese 20th century silver vase by NOZAWA TADAYOSHI. 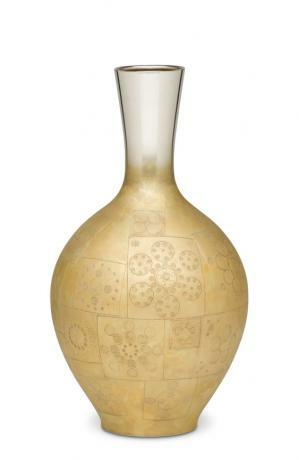 The vase is done with geometric design etched into the surface. Done in fine detail. Stamped JUNGIN, or pure silver and signed TADAYOSHI on bottom. The vase comes with TOMOBAKO, or original artist signed wooden storage box. The vase measur..
Japanese 20th century bronze vase by Living National Treasure bronze artist TAKAMURA TOYOCHIKA (1890-1972). 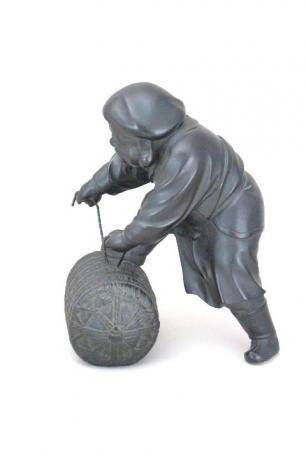 TOYOCHIKA was the son of he famous sculptor TAKAMURA KOUN. In 1908 he became the student of famous bronze artist TSUDA SHINOBU and in 1915 he graduated from the Tokyo School of Fine Arts. 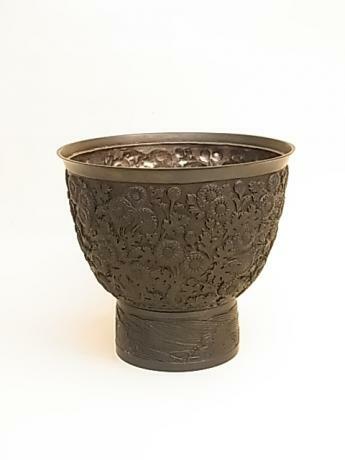 ..
Japanese early 20th century (Showa 9 or 1934) SHAKUDO and silver chrysanthemum design bowl by metal artist MITSUI YOSHIO. This bowl was made for the 15th TEITEN Exhibition held in 1934. MITSUI YOSHIO was born in 1899 and died in 1959. The bowl measures 5 1/2" tall and 6 1/2" in diameter. The b..